Good clean conditions on the Surf Coast yesterday morning ahead of a strong W'ly change and building W/SW swell which got large into the afternoon with stronger W/SW winds. This morning it's cleaned right up and is pumping with clean 4-6ft waves on the Surf Coast magnets, fun in protected locations east of Melbourne. The swell should ease a touch through the day as winds shift SW around midday. Photo from our Torquay report this morning. There's plenty more swell to come into the end of the week, even with the passing of the strongest frontal systems under the influence of the Long Wave Trough. 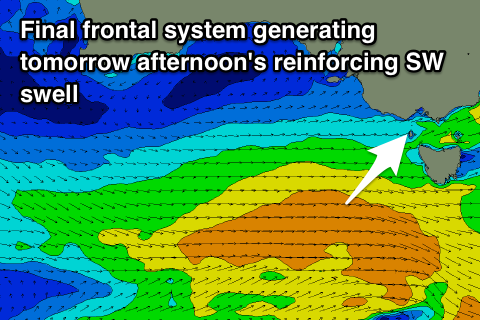 One final strengthening frontal system to our south-west today will generate a great broad fetch of strong W/SW winds in our south-western swell window, producing a reinforcing mid-period SW swell for tomorrow afternoon, easing slowly from Friday. Winds tomorrow will be great for the Surf Coast until mid-afternoon with a moderate to fresh W/NW-NW breeze, tending SW mid-afternoon. Surf to an easy 4ft is expected tomorrow morning, not dropping below 3-4ft into the afternoon, easing from 3ft+ Friday morning. The Mornington Peninsula will be a solid 6ft tomorrow, easing from 4-6ft Friday morning. Winds on Friday are dicey and most locations will see a moderate SW tending S/SE breeze, but the Torquay region will likely see a dawn W'ly. Saturday will remain less than ideal but should improve across the beaches to the east with a dawn E/SE breeze, tending lighter E and possibly even E/NE ahead of sea breezes. There should still be good amounts of swell with easing 4ft+ sets, 2ft+ on the Surf Coast. Sunday will be smaller and winds look more light and variable, creating clean though not perfect conditions. There's a new groundswell signal showing in the charts, but this is from a very distant source and won't offer any additional size. Instead the Surf Coast is expected to continue easing from a small 2ft with 3ft to maybe 4ft sets on the Mornington Peninsula. As touched on last update, we may see a slow moving storm developing south-west of WA and pushing slowly towards us through the weekend and early next week, followed by better secondary fronts. If this eventuates we'll see the surf building again from Tuesday next week but not to the size or quality of this week. More on this Friday. Huey just keeps on sending it. What a summer. I know, been filthy hey! Supposed to be 4 seasons in a day and we've had the good season this week! Pumping surf and some snow for Tassie, pretty cool for February! anyone know anything about the run in at fair haven with Pat Dangerfields cousin? Yeah......apparently Pat D's cuz paddled for a solid 2 footer and yelled 'yep'. A bloke down the line (who turned out to be Tex Walkers cousin) started paddling for the same wave and P.D's cuz yelled 'Oi'. Other bloke dropped in anyway and they both rode the standard Fairhaven close out side by side before jumping off in the shorey. That's where things got interesting! Turns out Tex's cuz deliberately dropped in as retaliation for Patty Dangerfield's switch from the Crows to the Cats a few years ago. (How he knew the other bloke was Patty D's cuz is anyones guess). Anyhow, they started arguing and then punching on in the shorey. Next thing, Gary Ablett, Joel Selwood and Rory Sloane have appeared from nowhere and it was on! Full on beach brawl with fists flying everywhere! Luckily, as it got to the point where it was nearly out of control, Tom Hawkins wandered down with a couple of Sherrins under his arm and all the boys stopped fighting and had a friendly kick to kick session on the sand instead. They were all last seen heading to the Aireys pub where apparently they had a massive 6 hour bender on the piss. Pretty rad eh!!! Hope that clears things up for you Nick. We should start a 'post of the week' category. Ringy, you've won the inaugural gong. I'll send ya down a leggie. LOL! That was very good. Tex's cousin did very well to take on all those Cats at once, earned his beer. Ahh... what's new about that?